The professor crisscrosses the Midwest for a collection of the region’s best grilling recipes: Grilled Pitas with grilled Red Pepper Dip he picked up in the Motor City; a spectacular Bratwurst “Hot Tub” – the tailgate classic from Sheboygan, Wisconsin; Mexican-style Grilled Corn from the Windy City and an all-new take on burgers – Veal Burgers with Dill from the Minnesota’s Twin Cities. Keep your leis on and your coals going for the tropical feast in this special night school edition of BBQ U begins with a Tuna “London Broil” prepared with a sesame-pepper-wasabi crust, served with a wasabi cream sauce and grilled baby pineapples. A succulent traditional rotisseried Honey Lime Huli Huli Chicken follows, and Steven wraps up his dissertation on Hawaiian barbecue with Huli Huli Pineapple, a carved whole pineapple painted with a brown sugar glaze as it spit roasts over a bed of glowing coals. From shoreline to foothills, the professor covers New England fish to fowl, summer to fall. He demonstrates tricks for shellfish shucking and how to avoid tipping over clamshells on the grill in Grilled Clams with Sambuca and Italian Sausage. Steven simply grills the perfect summer fish – Swordfish – and marries it with a summer salsa made with ruby red tomatoes and raw sweet corn. Finally, he tackles turkey – The Perfect Thanksgiving Turkey – on the grill, giving it the full New England treatment with a maple syrup brine and a Maple Syrup Redeye Gravy. This week’s episode celebrates grilling Bayou-style, with three New Orleans-inspired segments. 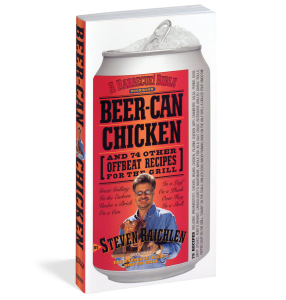 The first is Steven’s update of that Gulf Coast specialty shrimp ‘n’ smokies, grill-blackened catfish – a Cajun classic – with a side of fennel follows and this season’s twist beer can chicken – Cajun roastin’ chicken on a beer can – wraps it all up. 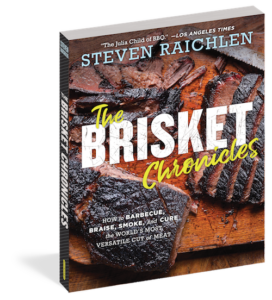 Barbecue from Texas and Oklahoma is about big flavors and big cuts of meat – in this episode Raichlen tackles a whole beef brisket Smoke-lahoma-style and pairs it with baked Pinquito beans (a regional speciality) before going whole hog and spit-roasting a whole ham flavored with Bourbon and apricots. 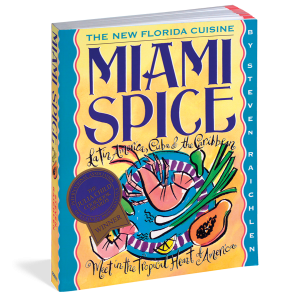 Spice-scented sweet potato casserole, grilled sweet potato pie and “drunken” steak round out the episode. Drawing on the traditions, favored ingredients and techniques of the Pacific Northwest, the professor leads a short and to-the-point master class on Pacific Rim grilling: Lemongrass Pork Sates with Peanut Sauce and Cucumber Relish that reflect the strong influence the cooking on the far side of the Pacific has on grillmasters here; salmon grilled on Alder planks from the northwest with citrus compound butter; and a dessert that marries sweet and savory – cinnamon grilled plums with an Oregon Pinot Noir wine sauce. A class of American classics: A Louisville slugger, a best of Memphis and a succulent St. Louis secret. Louisville Wings, a Raichlen favorite – simple and short on ingredients but extra long on flavor. 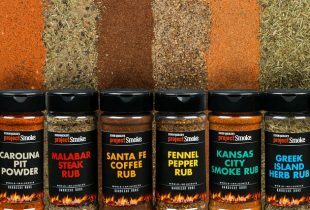 Indirect grill this old time crowd pleaser for a smokey and spicy start to any meal. 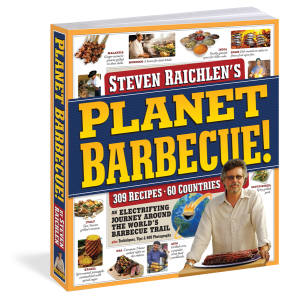 Then it’s on to Memphis, where Steven picked up this recipe for ribs from the justifiably famous Rendezvous restaurant. The Professor demonstrates how to make the restaurant’s timeless dry-rub mix, shows the art of applying mop sauce and a serves the ribs up with tangy side of Memphis Mustard Slaw. Right after the Big Red Machine and the Arch, this recipe for grilled Pork Steaks is a St. Louis classic in which the Professor grills up here along with tangy, mildly spicy red barbecue sauce. The Professor takes class to elegant Northern California for unexpected delights. Barbecued Oysters are paired with a savory Chipotle Horseradish Sauce just like they do ‘em at the Hog Island oyster company. Three main courses to pair with local wines: Grilled Tenderloin in Herb Crust with Grilled French Fried Potatoes, Duck Under a Brick with Grilled Figs and show stopping whole salmon stuffed with herbs, basted with butter and wrapped in aluminum foil. 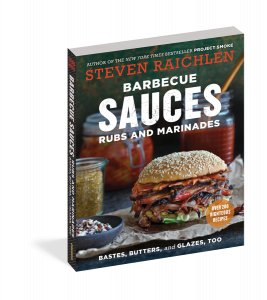 You can grill yourself home again – and in this episode Raichlen shows us all his home-turf tricks from the Mid-Atlantic. Soft Shell Crabs with Old Bay Tartar Sauce are quintessential Baltimore cuisine, here grilled rather than fried to bring out every ounce of the meat’s sweetness. Pit Beef is a Baltimore tradition, prepared with a salty beef rub, sliced thin and served with Pit Beef Horseradish Sauce. Always the history buff, the Professor rotisserie grills Spit-Roasted Lamb with Butter and Salt, a recipe that dates back to some of America’s first barbecues. The comforts of home wouldn’t be complete with out a tempting dessert: Blueberry Crumble, indirect grilled and served ala mode. The Professor takes a turn through the desert bringing all the flavors of the Southwest alive over live fire. He demonstrates Grilled “Fry” Bread – originally a Navajo dish – is a great side dish or can be drizzled with honey sprinkled cinnamon sugar for dessert. In Mexico, rellenos are fried, but Raichlen lays ‘em on the grill to produce smokey flavored BBQ Bean and Cheese Chile Rellenos. The he offers a southwestern twist on a Latin American favorite with “Churrasco” Portobello Mushrooms, complete with a garlicky rich chimichurri sauce. No Southwestern meal is complete with out a salsa and the Professor’s grilled Fiery Salsa Verde is will electrify everything from poultry to seafood, served here with chips. The Professor makes a swing through the South, gearing up the grill in Alabama, Tennessee and Georgia. Alabama’s Barbecued Chicken is famously served with White Barbecue Sauce – a surprisingly delicious creamy, peppery, spicy alternative to traditional red. Raichlen grills up Tennessee Pork Loin with Brown Sugar and Mustard and a shot of Tennessee whiskey and serves with a Nashville Sweet Barbecue Sauce. For the sweet finale: Georgia peaches on the grill, done up Raichlen-style in a delicious Grilled Peach Cobbler. This week the Professor hits the peninsula where they grill with snap in the sun. Feel the heat with Raichlen’s Jalapeno Jerk Baby Back Ribs glazed with Pineapple Barbecue Sauce. Florida’s Latin American influence is celebrated with Maduros, grilled plantains, so sweet and delicious you might call them banana candy. The state fruit gets a turn with Florida Tangerine Teriyaki Chicken Breasts and Salmon Kebabs Skewered on Sugarcane with Sour Orange Mojo. Class goes back to the banana tree for dessert with a zing: Grilled Bananas with Spiced Butter and Rum. A celebration of So Cal classics: Caesar salad that Steven takes to the grill, charred, tender artichokes with a Worcestershire Dip and a Santa Maria Tri-tip with Pinquinto Beans and Garlic Bread that proves Southern California has one of the country’s most delicious and unusual barbecue traditions. Fish is the “fear factor” in grilling: Will it stick? Will it fall apart? How do I know when it’s done? In this show, Steven Raichlen gives you his favorite strategies for victory at sea. No tricky turning maneuvers needed for Cedar-Planked Salmon, a dramatic presentation with incomparable wood flavor. Grilled Tuna with a gutsy Fire-Charred Tomato Chipotle Salsa is seared directly over a mesquite fire. Bacon-wrapped Trout, stream-caught just yards from the set and still dripping with water, are stuffed with Poblano Corn Relish and grilled in fish baskets over an open fire, Fish doesn’t get much fresher—or better—than this. Here’s a show for beef lovers featuring fantastic cuts of beef, new to most grillmeisters. Leading off is a clod (whole smoked beef shoulder), much beloved in central Texas and virtually unknown everywhere else on the planet. 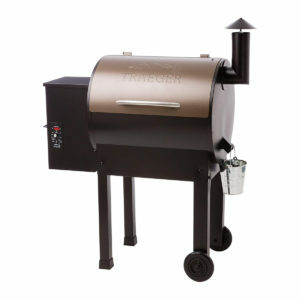 It’s 18 pounds of pure beef pleasure cooked low and slow to fork-tender perfection. Then, meet the new steak on the block – flame-seared flat iron, which Steven prepares in the south of the border style with chilies and mucho cerveza. Sooner or later, a vegetarian will show up at your cook-out, look into your carnivorous eyes, and ask to be fed. Don’t be caught flat-footed as a host. This meatless menu preempts the politically correct and will have even the most unrepentant meat-eaters sniffing the air hungrily. First up, flame-seared Portobello Mushrooms topped with cheese, the vegetarian equivalent of a cheeseburger. Reminiscent of a grilled steak is ginger-studded Grilled Tofu. And finally, Steven presents a smoky, revamped version of an American classic, Macaroni and Cheese with Fire-Roasted Onions. Pork is arguably the heart and soul of the American barbecue tradition. In this show, Steven goes whole hog with two terrific pork dishes. From the Deep South come Coffee-Crusted Pork Tenderloins with Redeye Barbecue Sauce. Then, demoing the very latest in hi-tech outdoor kitchens, the Professor spit roasts Coconut-Crusted Ribs and whips up some grilled Tropical Fruit Kebabs to accompany the ribs. Mindful of the suffering of New Orleans in the last year, this show pays tribute to Louisiana’s rich culinary traditions. 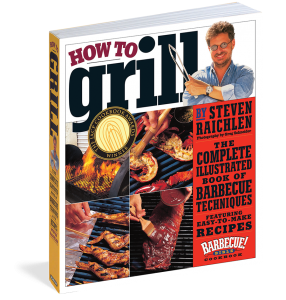 You know Raichlen’s rule: If something tastes good baked, boiled, or deep-fried, it probably tastes even better grilled. Case in point: Grill-Top Shrimp “Boil” jazzed up with grilled bratwurst—this isn’t like any shrimp boil you’ve ever tasted. And never mind that deep-fried turkey was invented in Louisiana: Steven cooks Big Easy Barbecued Turkey with plenty of wood smoke after literally injecting it with a spice-scented marinade. Cajun Tuna Pipérade combines the “Holy Trinity”–onion, celery, and bell pepper–with tomato, spicy andouille sausage and fire-licked sushi-grade tuna steaks for flavor that just won’t quit. 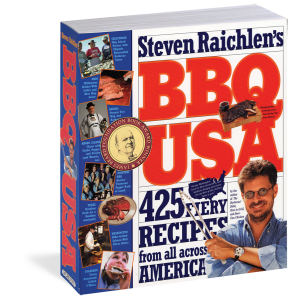 In American barbecue, ribs rule, and woe to the grillmeister who doesn’t understand the rules. Like never, ever boil. 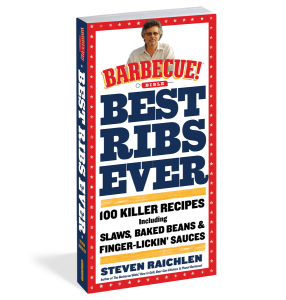 This is the rib crash course, appropriate for all skill levels, and a popular part of the curriculum at BBQ U. The Professor gives you a little background on bones before getting to the meat of the matter. Here’s the rest of the lesson plan: Classic spare ribs served with ember-roasted sweet potatoes; Dinosaur Beef Ribs, the biggest and baddest bones of all; finally, the refreshingly different, A-plus Mint Julep Ribs with a healthy hit of Kentucky bourbon. Cooking over hardwood trumps cooking over charcoal for several reasons. Main one? Flavor. 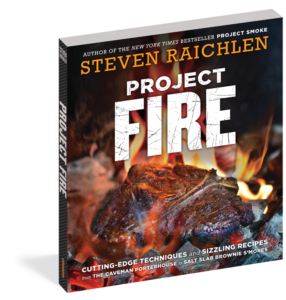 In this episode, Steven Raichlen tells you what you need to know about selecting the proper woods and matching them to your menu, building the perfect fire, and coaxing the maximum flavor out of your grilling. From this pyrotechnic glory will emerge Mario Batali’s Veal Chops with Lemon Oregano Jam. 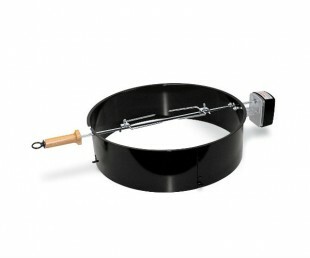 Then, a BBQ U first: a seafood and meat Paella wood smoked entirely on the grill. And finally, because even desserts get barbecued at BBQ U, Fire-Charred Pound Cake with Grilled Pineapple Salsa and Tequila Whipped Cream. Grilling is the performance art of cooking. And in every great griller beats the intrepid heart of a showman. This show is designed to add theatrics to your next barbecue. The Professor leads off with Butter and Herb Spit Roasted Turkey served with flaming Hot Pepper Kebabs; And even veggies get the shock treatment in Grilled, Dilled, and Chilled Eggplant Dip roasted directly in the embers. Steven steers the show back to BBQ U basics with Ember-Roasted Sweet Corn, grilled right in the husks. 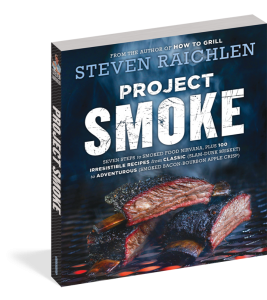 Extreme barbecue cuisine…today at the U.
Steven Raichlen brings the high-voltage flavors of the American Southwest to the grill with a take-no-prisoners menu. Oven-Grilled Tortilla Chips with Pineapple and Jalapeño Salsa start things off, followed by Green Lightning Shrimp Kebabs, assertively spiced and just this side of incendiary. Millionaire Brisket, a Texas-size slab of meat, gets the royal treatment with a savory rub, a coffee and beer mop sauce, and a long, slow smoke over oak. On the athletic field, there are concrete rules of engagement. But there are none governing the fiercely competitive sport of tailgating, meaning unsportsmanlike conduct and one-upsmanship in the parking lot usually get rewarded. Are you still in the minor leagues? 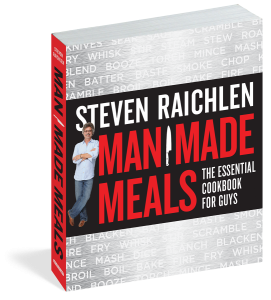 Learn some new moves from Steven Raichlen. Score extra points with a platter of Grilled Polenta with Italian Sausage and Peppers. Stun your opponents and delight your fans with Flame-Grilled Prosciutto Panini. Engage in fowl play by serving Steven’s indomitable Calgary Wings with zippy Maytag Blue Cheese Sauce. Study the Professor’s moves, and you’ll be doing your own victory dance. Lamb, so beloved elsewhere in the world, is underrepresented on American tables: Per capita consumption here is about 1 pound per year. Steven Raichlen’s succulent Lamb on the Rod with mini sweet peppers could be the recipe that turns the statistical tide. Then it’s double-digit thick and double-digit good Lamb Chops and Lamb Steaks served with a Parsley Onion relish and a tangy Feta Cheese Sauce. The Professor is on the lamb at BBQ U. Pit masters are obsessed with breasts. (Chicken and turkey breasts, that is.) 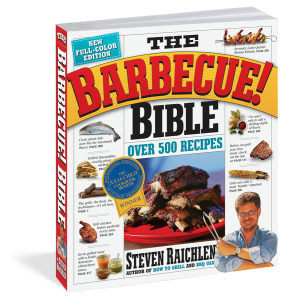 This week, BBQ U Professor Steven Raichlen takes on America’s most popular cut of poultry. It’s all about how to keep white meat juicy when grilling and barbecuing. First, from . Balthazar, the boisterous, “see-and-be-seen” bistro in Lower Manhattan, come easy and fabulous Tarragon Chicken Paillards, which are pounded paper thin and smokily seared on the grill. And then Maple-Smoked Turkey Breast gets a triple-blast of flavor from maple sugar rub, a maple syrup glaze, and a long slow smoke over…you guessed it…maple wood. 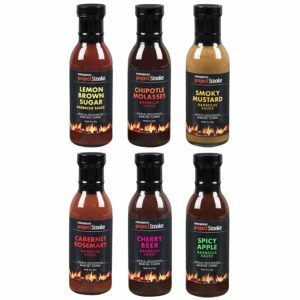 Jump-start your next party with a quartet of pass-arounds hot off the grill. The episode leads off with a twist on a pu-pu platter classic: Pancetta-Grilled Diver Scallop Rumaki. Next up in the starter category, Summer Sausage S’mores, think-out-of-the-box grilled sandwiches topped with cheese and jalapeños. And finally, Steven’s barbecued version of Chinatown Ribs; they’re sizzling, sweet, salty, aromatic with ginger and scallions, and the quintessential hand-to-mouth food.